I can’t believe the Fourth of July is right around the corner. I just don’t know where the time has gone. I hope you all enjoy time with family and friends over the holiday weekend. Thank you to those men and women in the military that unselfishly serve our country. July is a busy month in the shop. We have several classes and events scheduled. I hope you will take some time to join us for one of them. The Row by Row Shop Hop got off to a great start. The Quilt Essentials’ row pattern is a rotary cut, pieced block featuring the Steamboat fabric. Our license plate is unique to Laramie. So what’s the significance of our license plate? Laramie, Wyoming sits at an elevation of 7220′. It is our “Home Sweet Home”. Our town is home to the University of Wyoming and visitors here can see many wonderful tourist destinations like Vedauwoo, Snowy Range and Quilt Essentials. Please join us for Row by Row. We can’t wait to see visitors from last year and new visitors to our area. We had a drawing the first day for a 40% of discount. The winner of the drawing was Erin Campbell-Stone. Join us for the fall Quilt Essential’s UnFinished Objects (UFO) quilt retreat on Oct. 20-23, 2016. We will gather at Sunlight Meadows Ranch on Oct. 20th at 3:00. Sunlight Meadows Ranch is at 1000 Dear Meadows Way, Livermore, CO 80536. It is about 45 miles from Laramie and 15 minutes from Red Feather Lakes. Bring whatever projects you are working on. We’ll spend time quilting, laughing, eating and forming new friendships and strengthen old friendships all while enjoying the fall scenery. Registration fee is $275. The fee covers lodging and meals. 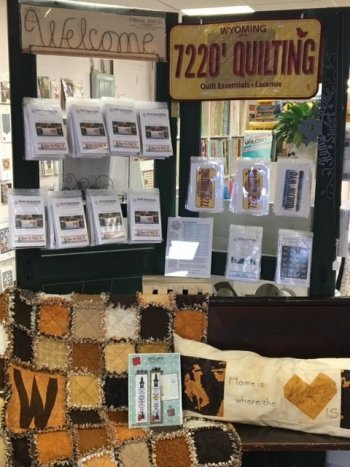 Make sure to check out the Quilt Essentials calendar for upcoming events or follow us on Facebook. Below is a schedule of events. For more information check the website or stop by the shop. P.S. We discovered that we made an error in the Happy Camper quilt kits. If you purchased one from us please contact the shop so we can correct our error.